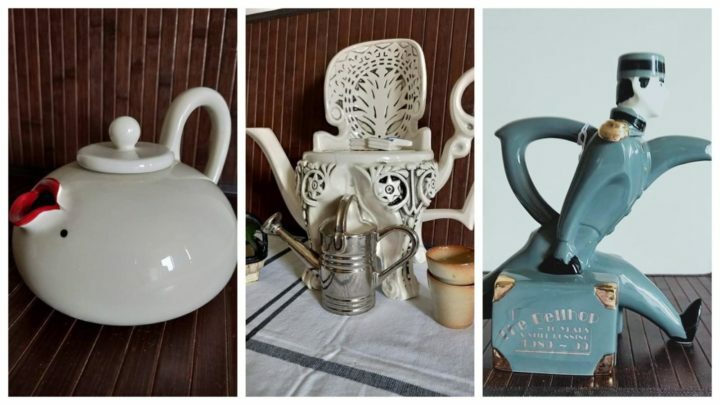 I collected teapots for more than 35 years, but had no idea they would end up being such a lucrative investment. I absolutely loved my collection. They weren’t just ‘things’ to me but were memories of travels, experiences, smells, feelings and emotions; each ‘spoke’ to me, conjuring up recollections of people and places. I had three cabinets filled with teapots. A conservative estimate would probably have totalled around 130 teapots in my collection. We travelled a lot as a family and, many years ago, had hit on the idea of buying a teapot from each of our destinations. London, Cairns, Paris, Ballarat, Venice, Montville, Cardiff, Sydney, Los Angeles, Christchurch, New York, Hobart … Well, you get the idea. There was always room left in my suitcase for the transporting of these treasures. Even the kids thought it was ‘cool’. In addition, family and friends had taken to giving me precious, quirky and funny pots for presents. I remember each and every one of these, but would never put a dollar value on any. My collection was a source of pride and joy but, as it turned out, one of great sadness too. Downsizing comes to most of us and therefore we must part with the lion’s share of our treasures. Strangely, it never occurred to me that my beloved china would be a casualty. In the past, not only my blood kin boasted of ‘our’ teapots, but extended family and friends would ‘drool’ with ‘oohs’ and ‘aahs’. I truly thought I would be crushed in the stampede to ‘grab a teapot’ when we announced our ‘downsizing to unit living’. Sadly, all I heard was that eerie desert rolling thistle-bramble-bush silence and that sad, sad cowboy lonesome whistle that declared a complete an utter lack of interest. Nobody but nobody gave a flying fig about my precious compilation of globe-gathered artefacts? Really? Indeed it was the case. Folks had their own ‘stuff’, houses were ‘too small’. Blah, blah. The fact was, no one was in the least bit interested in my ‘dust collectors’! Dust collectors!! I was cut to the quick, so to speak. I must say the wider teapot collecting community was interested (very interested, actually) so disposing of said items was no problem. Some pots had increased dramatically in value over the years; I was gobsmacked. A few even fetched over the $500 mark. Perhaps fittingly, the proceeds enabled us to enjoy quite a luxurious south-east Asian holiday. Naturally, I kept a few teapots, but couldn’t put them on display for many years; it simply broke my heart. Then, one day it was all okay. I had collected, I had loved and appreciated each piece, I saved the most precious and I had lots of photos to remind me of what an exceptionally blessed and exciting life we’d had … so far. The fat lady may be warming up her vocal cords, but she ain’t singin’ yet. Word to the wise, collect thimbles! Do you collect anything? Are you concerned about having to get rid of your collection during a downsize or declutter?